As businesses go ever more mobile, they have had to adapt existing technology and adopt new gadgets to keep things running smoothly. The SM-T300 mobile printer from Star Micronics is the next step in increasing business mobility. It communicates via wi-fi or Bluetooth with a smartphone, iPad or Android device to print receipts and delivery confirmations even when the office is miles away. 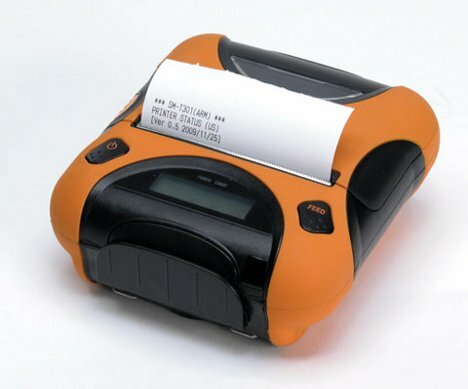 Thanks to its integration with a number of devices, the mobile printer could take the place of the invoices, receipts and work orders that are now written out by hand. The SM-T300 is waterproof, dustproof and can withstand drops of up to 1.5 meters, making it tough enough to handle being taken on the road. The printer even comes with a built-in magnetic credit card reader so it can issue receipts for credit card payments at trade shows, flea markets and festivals.